This Summer I started knitting for the very first time. After some coaching from our fearless leader, Liz McCubbin, I took my needles and yarn home to get to work. In about ten minutes, I managed to mess things up royally. The next week I brought my tangled mess back to the class, and Liz was able to miraculously resurrect my feeble attempts into something identifiable as knitting. This pattern continued for several weeks, but each time I managed to work a little longer before things devolved into entropy. Often, when fixing my knitting, Liz would ask me, "Do you see what I did there?" I did not see. For me, all the threads seemed to be held together by some strange magic. Slowly, very slowly, I became familiar with what the stitches should look like and was able to catch some of my mistakes. It still feels like magic, but I trust that the continued practice of weaving threads together will make something useful. 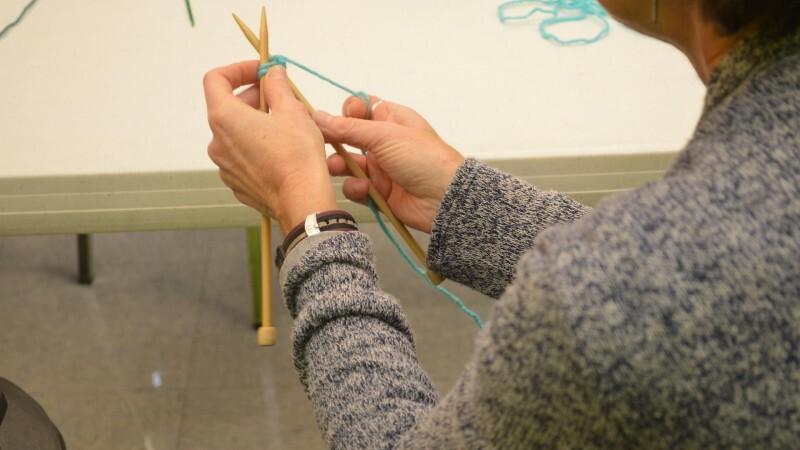 I look forward to our knitting classes every time we meet, and while I find the act of knitting enjoyable (most of the time), what I really enjoy are the stories and conversations that happen around the knitting. As we weave yarn into scarves and hats (and some of us work on more avant-garde projects), we are knit together ourselves. We learn about each other's families, histories, jobs, pets, and favorite pies. At some point in time, we all mess up. We make mistakes and need some help. And without fail, our mistakes are met with welcome, grace, and understanding. Someone else comes along and peers into the threads of our work and helps us see what's going on. And so we are stitched together a little more. It's happening with needles and yarn, time and conversation. It's still something like magic. Or maybe it's miraculous like loaves and fishes. But as we practice knitting I feel like we are making things just as we are being made.